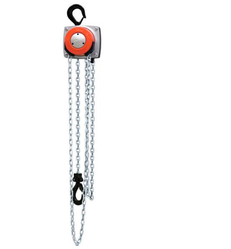 Chain Hoist available with G80 chain for best result from 500 kg to 2 ton capacity. Incorporated in 2003, we have been instrumental in offering a broad range of Ratchet Lever Hoist. This hoist is extensively used to lift and move bulky materials at various automobile and shipping industries. We are offering Chain Hoist. We are a renowned entity, deeply involved in offering quality range of Single Phase Chain Hoist. The hoist provided by us is manufactured using optimum grade components and sophisticated technology under the guidance of highly skilled professionals. Our offered hoist is suitable for lifting heavy material at construction sites. With enriched market experience, we have been able to offer a wide spectrum of Electric Chain Hoist.